It's been almost a month since our wonderful trip to the Subzero & Wolf Headquarters in Wisconsin. At the facilities we spent two days fully immersed in the culture and products. Led by Subzero/Wolf experts, we explored the depth and breadth of the product lines, the up and coming changes, improvements, and additions to the appliances, and the company’s core values. And to top it all off, we had the pleasure of interacting with their executive chefs during live cooking demonstrations in state of the art kitchens. I've taken some time to reflect upon the trip and wanted to create a blog post highlighting my take-away from the training trip. Enjoy all the photos (especially of the delicious food)! From the start it was apparent that the good hospitality and overall friendliness wasn’t just a gimmick (although it may be true what they say about New Jerseyans vs. the rest of the country!). It was a genuine reflection of the company philosophy and commitment to quality that Subzero & Wolf are so well known for. Subzero & Wolf strive to guarantee their products for 20+ years. 20+ years is a bold statement for any company to make. However, after touring their factories I can see why they are so confident in their products. No photos were allowed during the factory tour (keeping all their secrets very private for obvious reasons), but I can tell you from first hand experience the care taken to manufacture these appliances is truly top of the line. Rigorous testing is done throughout the entire process both by computers and human hands. The most interesting thing I learned was that Subzero & Wolf do 3x the amount of testing on their appliances as it takes to actually manufacture them. Whether it's due to the economy or online shopping (hello, Amazon), it’s difficult for businesses (whether big or small) to survive. It’s also very uncommon for large businesses like Subzero/Wolf to still be family owned since inception in 1945. Jim Bakke (grandson of Subzero founder, Westye Bakke) still has a hand in all the products and innovations developed by Subzero/Wolf to this day. Being a family owned business ourselves, the company history of Subzero/Wolf is both inspiring and impressive. To learn more about the company history, click here! The Subzero brand is known for their patented technologies which create the perfect refrigeration environment. The Wolf brand is known for top of the line, professional cooking appliances readily available for the home chef (more than just the symbolic "red knobs"). Now, with ever changing technology and trends it’s important for Subzero/Wolf to keep up with the times without sacrificing quality and functionality. We spent a lot of time discussing how modern technology, such as inter-connectivity, is being incorporated into their own appliances. Seeing how the products work with devices such as phones and tablets was a look into the future of kitchen design and how we function in our homes. These advancements paired with the company’s years of expertise truly makes for a special product. *Pro Tip - Keep an eye out for the release of the Cove Dishwasher designed by Subzero/Wolf. The next best thing in dish-washing experience! My favorite part of the Subzero/Wolf training trip had to be our time at the Barn at Harvest Haven. Harvest Haven is a garden that was developed on the property of the Subzero/Wolf facilities. Items from the garden were actually used for menu inspiration and meal planning during our visit. We had the pleasure of watching professional chefs cook our lunch everyday with fresh and interesting ingredients, all while using top of the line appliances in a beautifully designed kitchen. The Barn itself is situated in front of the garden and is one of the most beautiful, warm, and welcoming spaces I’ve ever seen. As a kitchen designer who loves to cook and grew up in a 1700s farm house, this is what dreams are made of! Joel Chesebro is the corporate chef for Subzero/Wolf that explained the benefits of each appliance, offered cooking tips and tricks, and guided us through the beautiful garden. Below is a great video explaining the story behind Harvest Haven. 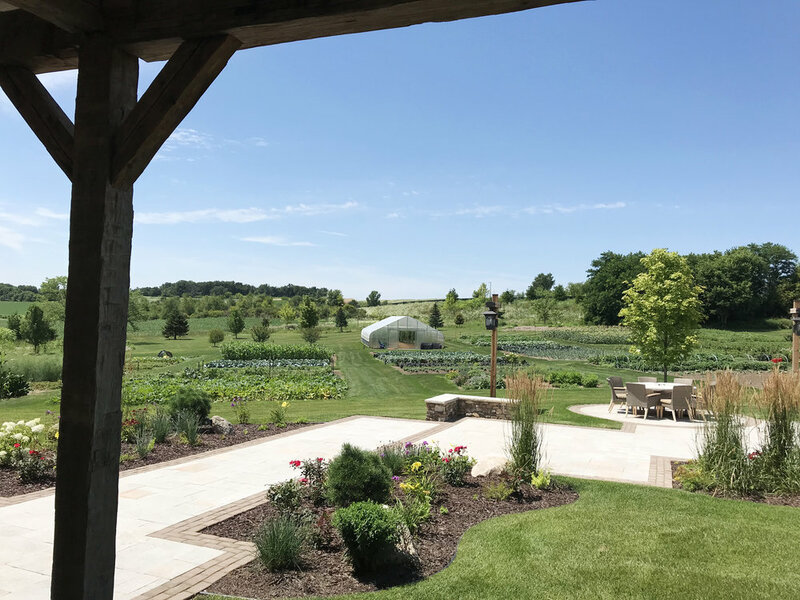 *Luckily we got to visit Wisconsin in July and got to see the garden in all it's glory! We were also urged to cook our own breakfast every morning so we could experiment with all the different appliances. 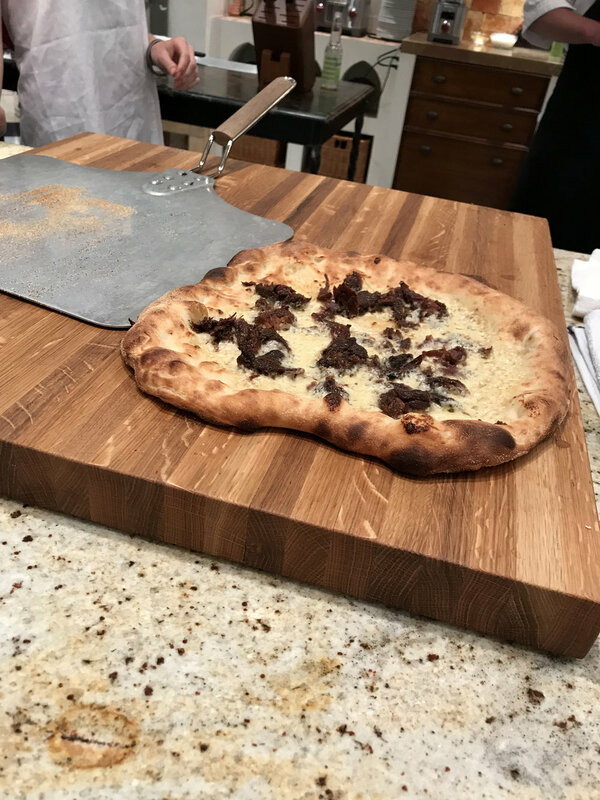 From an induction cooktop to a traditional French top, I was able to experience first-hand different methods of cooking the same meal. What more could we ask for?! While the food and special treatment was fantastic, this training program isn’t just a smart marketing tactic to entice designers to specify their products. Whether a seasoned designer or new to the industry, this was a valuable learning experience. From the in-depth training sessions to interacting with fellow designers from all over the country, the lessons we learned here made me excited to incorporate new ideas and techniques into all of our kitchen designs. *This is a non-sponsored blog post. All thoughts are my own and the amazing food has not swayed my opinions in any way. Over the years we have designed and remodeled hundreds (if not, thousands) of kitchens. Every client and kitchen are different, which makes for a very interesting job working as a kitchen designer! But every once in a while, a kitchen comes along that really makes you stop, think, and appreciate the beauty of transformation. One of the most rewarding experiences is creating a space that puts a smile on the homeowner’s face every day. This project is one of the ones that makes us smile. This kitchen was long over due for an update. The homeowners work hard every day and enjoy having a space to come home to cook in at the end of a long day. Their existing kitchen was lacking in storage space, function, and aesthetics. The space definitely didn’t stand up to the elegant and traditional style of the old Victorian home. Most notably, the layout of the kitchen also felt disjointed with oddly placed windows and valuable space that wasn’t being used properly. Working within an existing space can be challenging, but seeing this kitchen for the first time felt like a good opportunity to push the limits a bit with the layout in order to show the homeowner’s the potential of their space. The homeowners were used to having a pantry cabinet in their existing kitchen, so this was something they couldn’t sacrifice in the new design. For someone that bakes often, a Kitchenaid Stand Mixer is a must. They are very heavy and can be difficult to store, so most people typically leave them on the counter (taking up valuable space). The solution here was to dedicate a cabinet with a mixer lift and outlet inside the cabinet. This way the mixer is easily accessible when needed and can be hidden when not in use. A designated section for baking (not within the main working triangle of the kitchen), was important to the homeowner. This area also includes the Base Mixer Lift and additional storage for baking sheets, mixing bowls, etc. The existing island was more of a table/furniture piece that lacked closed storage. In a smaller space, maximizing storage is typically at the top of the list. A drawer cabinet and trash pullout were used to create the island, along with simple detailing and a contrasting color. A trash/recycling pullout is a no-brainer in kitchen design, but the composting request is a new one gaining popularity. We were able to find a pullout with 2 large bins (trash/recycling), and two small bins with lids (composting). This was included in the island as mentioned above. The original built in cabinetry in the kitchen had seen better days. Typically, we’re all for salvaging original woodwork, but this was screaming for attention. The homeowner requested a mix of open shelving and glass cabinetry for display of plates and miscellaneous pieces of importance to her. This area also became a nice focal point of the space. Taking advantage of the extra space above the existing cabinetry was important for these homeowners. The open space was wasted space that could be used for additional wall cabinet storage. One of the most popular requests we receive, we incorporate a spice pullout (or two) into almost every kitchen. Last, but not least! We actually received this client as a lead through Plain & Fancy’s website. The homeowner had always dreamed of having Plain & Fancy cabinetry in her kitchen, and we were able to make that dream a reality! To learn more about Plain & Fancy Custom Cabinetry - click here! This project is a great example of how with a little creativity you can completely transform a kitchen within the existing space (without tearing down all the walls a-la Fixer Upper style!). We hope you enjoy this kitchen as much as we do!